Synopsis : Review of the Apple iPad Mini including accessibility features for people who experience forms of disability. Apple has just revealed a new product called the, "iPad Mini," that comes in Black & Slate or White & Silver. The product is 7.87 inches by 5.3 inches, making it easy to handle and use. It is a mere 0.28 inches thick and weighs less than a pound. The iPad Mini comes with your choice of 16, 32, or 64 gigabytes of storage. Apple's 7.9-inch version of its popular 10-inch iPad tablet. The launch of the iPad mini by Apple has gained huge interest - as much as anything for the fact that Phil Schiller compared it directly in onscreen presentations to the Google Nexus 7, pointing out the differences in some app experiences and screen area available for web browsing. 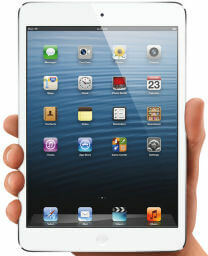 The iPad Mini display is 7.9 inches across diagonally, is LED-backlit, and is multi-touch with IPS technology. The screen offers 1024 X 768 screen resolution at 163 pixels per inch. The screen is fingerprint-resistant with an oleophobic coating. The iPad Mini comes with a Dual Core A5 processor. When it comes to power and the battery, the iPad Mini has a built-in 16.3 watt-hour, rechargeable lithium-polymer battery with up to 10 hours of Wi-Fi web surfing, video watching, or music listening capability. You can charge the battery through its power adapter or through a USB port on your computer. The iPad Mini also comes with some very disability friendly features. The iPad Mini's touch screen technology, along with the size of its screen, are incredible accessibility features for people who experience forms of mobility disabilities. People who experience skeletal or muscular forms of disabilities can find themselves with the ability to interact with the touch screen in ways a more conventional computer makes more difficult. The ability to use the touch screen can add the ability to interact with others and communicate using software and can be integrated into a person's daily life rather easily. A number of scholars and others who have been working with disabilities have noted how touch screen technology may work particularly well for people who have experienced a stroke, or for people who experience communication limitations. Audio-based software with the ability to transfer simple touch commands into spoken words might allow for standard communication from people who do not have the ability to physically communicate, providing them with fantastic benefits. Touch screen technology and the iPad Mini could also allow people with limited mobility to read books without the need to handle a heavy form of printed media or to control media devices, giving them the ability to interact with the world easily. The numbers of people with disabilities the iPad Mini could positively affect is massive - particularly people with spinal cord injuries, muscular dystrophy, or other forms of disabilities that limit their ability to use hand gestures. VoiceOver is a feature that began on the iPod Touch and iPhone. It permits images and text that are visual on the iPad Mini to be made into audio for people who are blind or visually impaired. What this means it VoiceOver will allow a person to simply browse their fingers around the surface of the iPad Mini and onto different areas and hear what the description of an item is so they may easily make choices. VoiceOver has also been made available for applications so people can start developing applications meant for use by people who are blind. The National Federation of the Blind (NFB) has commended Apple for creating a device people can use right out of the box for people with visual forms of disabilities. The NFB statement even mentions that the touch-screen technology, 'need not be a barrier,' for people who are blind. While computer technology enthusiasts, technology columnists, as well as people in the general public may not know quite where to place the iPad Mini into the existing media landscape, people with visual disabilities perceive it as the only e-reader worth owning. Many people experience hearing that is limited to one ear only. In the same situation as VoiceOver, the iPad Mini allows for mono audio options for people who have the ability to hear from one ear. What this allows for is audio that is usually presented through two ears to be presented through one ear, providing a person with all of the audio information. Mono Audio can also be used along with certain iPad Mini headphones that make using it easer for people who experience a hearing impairment. The question on some people's minds is, 'What is Siri' Siri is an intelligent personal assistant that helps people to get things done simply by asking. Siri allows people to use their voice to make phone calls, send messages, schedule meetings, and many other tasks. Siri is not like more traditional voice recognition software that requires people to remember certain keywords or speak specific commands. Instead, Siri understands a person's natural speech and asks them questions if it needs additional information in order to complete a task. To talk to Siri you hold down the, 'Home,' button after which you will hear two rapid beeps and see, 'What can I help you with,' presented on the screen. Simply start talking! The microphone icon will light up to let you know that Siri is listening. After you have started talking to Siri, tap the microphone icon to talk to it again. There is more than just one way a person can talk to Siri. The software works with Bluetooth headsets and headphones too. When you are using headphones with a remote and a microphone you can press and hold the center button to speak to Siri. With a Bluetooth headset you can press and hold the, 'call,' button to bring up the Siri program. If you are in a car that supports, 'Eyes Free,' you can start a conversation with Siri simply by pressing a button on the steering wheel. Siri will wait for you to stop talking, although you may also tap the microphone icon to tell the program you are finished; something that is useful if there is a lot of background noise. When you are done talking to the program, Siri will display the text of what you said and respond to you. If Siri needs additional information to complete a task, it will ask you a question related to it. For example, if you ask Siri to remind you to pick up a prescription, Siri might ask you, 'What time would you like me to remind you' If you use earphones or a headset, the program will read back email or text messages you have dictated before you send them. It will read you the subjects of reminders before you create them as well, something that is particularly useful if you are driving and are unable to view the screen itself. One of the really neat things about Siri is that you can speak to the same way you would to a person, in your natural voice and in a conversational tone of voice. If; for example, you want to know what the weather will be like, you can simply ask Siri, 'What will the weather be like,' or, 'Is it going to rain' It doesn't matter how you ask, Siri will tell you the weather forecast. Siri works straight out of the box without any additional work on your part. The more you use the program the better it will understand you. Siri accomplishes this by learning about your specific accent and other characteristics about your voice. How? Siri uses voice recognition algorithms to categorize your personal voice into one of the dialects or accents it already understands. The more people who use Siri and it is exposed to, the more variations of a language it is exposed to, the greater its overall recognition of accents and dialects continue to improve and make it work even better than it already does. Siri helps by learning about the important people in your life as well. The first time you ask Siri to remind you to call your sister, for example, Siri will ask you who your sister is and then store the information in Contacts. Then, when you ask Siri to remind you of a task related to someone important in your life the next time, the information is there and ready! Siri can speak any text that is displayed in responses from the program; you can dictate messages into text or email messages, and more.